A dismal and scary picture of the tomato notwithstanding, there are some green shoots to be seen. The Fast Food Nation for the alluring Tomato. Despite a flagging and longer than needed second section, this book is an outstanding look at the tomato and at how modern agriculture has ruined the fruit, err.. no vegetable. The tomato we eat has undergone several changes. It is larger. It is rounder. It is redder. It is longer lasting. It doesn't taste like a tomato. It is less nutritious than the tomato. It is grown in places where a tomato should not be grown. Compared to the tomato from fifty years ago, "According to analyses conducted by the U.S. Department of Agriculture, 100 grams of fresh tomato today has 30 percent less vitamin C, 30 percent less thiamin, 19 percent less niacin, and 62 percent less calcium than it did in the 1960s. But the modern tomato does shame its 1960s counterpart in one area: It contains fourteen times as much sodium." This then is a book about the tomato, and how it has changed over the last hundred years or so. The change includes changes to the tomato itself, and everything that touches or is touched by the tomato - the places where it is grown, the people who grow it, the chemicals and toxins that bathe the tomato, the stores that sell it, the scientists who are hard at work to revive the tomato, and where we may go from here. This book can be seen as divided into three parts. The first is a look at the history of the tomato, and how modern industrial farming has reduced it to a round, tasty looking, long lasting, pesticide-laced tasteless industrial product. The second part is a look at the industrial farms of Florida where, shockingly, modern-day slavery thrives, and where farm workers live in worse than dilapidated conditions. In the third part the author goes in search of optimism - from researchers trying to undo fifty years of damage to the tomato and trying to breed a tastier tomato that can still be grown profitably, to small, independent farmers trying to grow the good old tomato the good old way, organically, profitably, and equitably - where farm workers are paid decent wages and sometimes even health benefits. The history of the modern tomato goes back half a millennium or more. Most of the tomatoes in the United States are grown in the sunshine state of Florida. The state least expected to grow tomatoes. "...the majority of the state’s tomatoes are raised in sand. Not sandy loam, not sandy soil, but pure sand, no more nutrient rich than the stuff vacationers like to wiggle their toes into on the beaches of Daytona and St. Pete." If it were left up to the laws of botany and nature, Florida would be one of the last places in the world where tomatoes grow. Tomato production in the state has everything to do with marketing and nothing to do with biology. So you have Florida as the tomato state of the union. Where the vine is green and as are the tomatoes, till they are gassed with ethylene. Where the soil needs to be fumigated with methyl bromide ("one of the most toxic chemicals in conventional agriculture’s arsenal") - a substance that depletes the ozone layer, where the crop then needs to be protected from "at least twenty-seven insect species and twenty-nine diseases", where the "... conventional Florida farmer has a fearsome array of more than one hundred chemicals at his disposal" to combat these pests, and where "thirty-one different fungicides" are used to keep the leaves green and spotless. All of this adds up to more than eight million pounds of "insecticides, fungicides, and herbicides" applied to tomato fields in the state of Florida in one single year - 2006. So is methyl bromide harmful? And what about other cocktail of pesticides and chemicals? Like "endosulfan, azoxystrobin, chlorothalonil, methamidophos, permethrin trans, permethrin cis, fenpropathrin, trifloxystrobin, o-phenylphenol, pieronyl butoxide, acetamprid, pyrimethanil, boscalid, bifenthrin, dicofol p., thiamethoxam, chlorpyrifos, dicloran, flonicamid, pyriproxyfen, omethoate, pyraclostrobin, famoxadone, clothianidin, cypermethrin, clothianidin, cypermethrin, fenhexamid, oxamyl, diazinon, buprofezin, cyazofamid, deltamethrin, acephate, and folpet." you mean? Well... methyl bromide can "... kill humans after brief exposure in small concentrations. Sublethal doses cause disruptions in estrogen production, sterility, birth defects, and other reproductive problems". This - a look at the plight of the tomato farm worker - forms the middle and the most substantial section of the books. It takes a detailed and long look at their conditions and efforts by groups to provide better and safer working conditions for these workers. This however is also the section that goes on and on and on. While interesting in its own right and probably deserving of a separate book in itself, I started to wonder if the labor employed on tomato farms was the main focus of the book. But just as I started to despair, the book moved on to other aspects of tomatoland. So why is the tomato in so much trouble? The single biggest reason, the blame, has to be the tomato itself! It is a difficult fruit to please. Or more correctly, it is a difficult fruit to grow. It is difficult to balance the twin needs of taste and toughness. The tomato's skin has to be tough enough to withstand being plucked, packed, transported, and then placed on shelves in supermarkets - sometimes thousands of miles away. "The structure of a tomato also makes breeding for both taste and toughness a difficult balancing act. The gooey part of a tomato, called locular jelly, has most of the all-important acidity. The pericarp tissue, the walls of a tomato, give it strength and some sweetness, but no acidity. The harder a tomato is, the more bland it is likely to taste." [location 2385]. Longevity is prolonged by keeping it cold. Chilling the tomato below 50F also destroys its taste - "reduces the fragrant volatile chemicals that are all-important in giving the fruit its distinctive flavor". If you pick a tomato when it is ripe it will spoil long before it makes it way to the grocery store in far away lands. If you pick it when still unripe it looks green and unappealing. So scientists conjured up a way to give the tomato a red appearance even as the tomato was unripe - by gassing it with ethylene, a "gas that plants produce naturally as a final step in maturing their fruits"
In summary, I think this book is a sort of Fast Food Nation for the tomato. 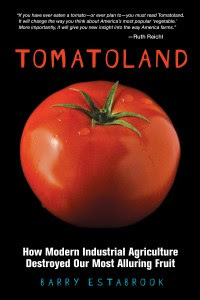 While Fast Food Nation is a tour-de-force, Tomatoland still engages, educates, and shocks - it is a must-read. Highly recommended.